In honor of the rare scene of wintry snow in NC today I decided to continue with my observations about Buffalo, NY. As a North Carolinian I have a special relationship with both snow and upstate New York. Substantial snow (as in the kind that sticks) is not that common here so when it falls we tend to react to it with either wonder or abject terror. Many of us grew up with a secret envy for the Hoth-like permafrost that encases doorways and buries cars up north though. Of course this might be the result of behavioral conditioning as every young North Carolinian knows that the reward for a few snowflakes is day without school. Sometimes all it takes is the threat of snowflakes. I've often wondered if we end up carrying this attitude into adulthood and subconsciously resist driving or working. Deep down in our programming is the knowledge that nothing can function if you can’t see the ground. Buffalo in particular is infamously well known for its abundant lake effect snow (250cm per year.) Apparently a lot of this perception stems from a powerful and well publicized blizzard in 1977 which produced hurricane force winds, 10 m snow drifts, and wind chills down to -50 Celsius. As I learned last summer, though, it’s not actually the Land of Always Winter (which is obviously beyond the wall in Canada). Aside from the grass always being greener (or maybe whiter) there’s a special connection between upstate NY and NC. Transplants from upstate, including Joe, comprise an sizable portion of NC’s immigrant population. When I looked for some statistics to back this anecdote up I came across this interesting visualization from the NY Times that tracks migration between states. Here's the same information mapped out. At 4%, fewer North Carolinians were born in NY than I would have guessed though they, nonetheless, comprise the single largest state migrant group or 10% of non-native tar-heels. Either way I grew up surrounded by Upstate folks and their wild tales of snow (and constant mockery for our reaction to it). Buffalo has a lot of stories worth sharing and a lot of lessons for cities. It has its architecture, its magnificent ruins, and its lessons about what Jane Jacobs called cataclysmic money. I call Buffalo the Ghost of Christmas future for other American cities when the spigot of growth starts to sputter. I plan to delve into these urban lessons over time, but in honor of the great NC tradition of the “Snow Day” I want to share some odd and less known Buffalo trivia. That “Buffalo buffalo buffalo Buffalo buffalo” is one of the longest grammatically correct sentences in the English language consisting of a single word. Make sense? A less ridiculous way to say that would be “Buffalo who are from Buffalo, NY, buffalo other buffalo who are also from Buffalo, NY. You can actually keep it going indefinitely but there are limits to how much “meta” I will tolerate. It’s not exactly Buffalo trivia but it's awesome nonetheless. I recommend the city adopt it as a slogan. See this helpful graphic for details. Resources flowed to Buffalo and then on to NYC and the World via the Erie Canal. That basically every bowl of Cheerios poured in North America since 1941 was produced in Buffalo and most still is. People typically associate Buffalo with its namesake: the wing, but Buffalo’s history is deeply rooted in grain and cereals. If the wind blows in the right direction, downtown smells strongly of Cheerios. So much so that "My city smells like Cheerios" has become something of an unofficial slogan. Buffalo was the primary transshipment point for the vast agricultural riches of the Midwest to the export market in the Atlantic. 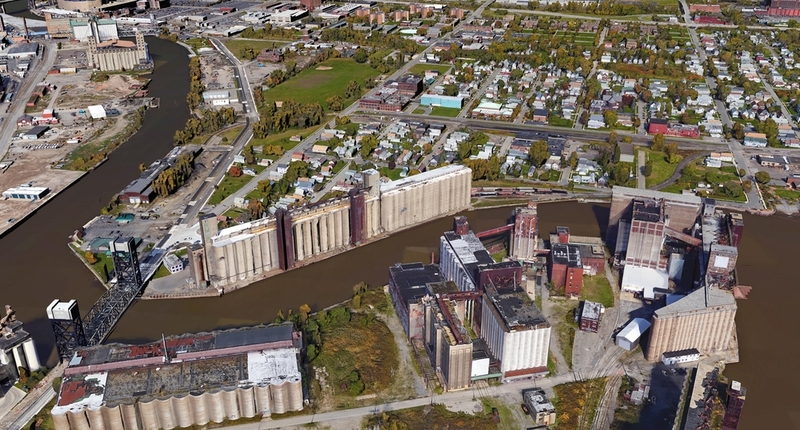 So much Midwestern grain passed through Buffalo that the world’s first modern grain elevator was developed there. The most visible remnants of this legacy are the monolithic structures that comprise Silo City. General Mills is in the background next to the bridge. Thanks Google for making Google Earth Pro free. For a sense of scale, just one of these facilities is responsible for that many bowls of Cheerios. Imagine, then, the capacity of Silo City at full production. Today, like many industrial remnants, Silo City is in the process of adaptation and evolution as it becomes a historic, cultural, and recreational center. I like this response from a local artist who envisions turning other blank wall spaces advertisements. Besides breakfast cereal an abundance of grains and water is attractive for the production of beer. Buffalo is also home to the US HQ of LaBatt. I'm not sure if that means its actually brewed there or if they just have offices there but they did recently paint several grain silos to look like massive beers. With its access to half the nation's population (40 million) within one day by train, it was chosen to host a World's Fair. That in 1900 Buffalo was the 8th largest city in America. Back at the turn of the century The City of Light was burgeoning with its Olmstead designed streets awash beneath its Tesla powered streetlights. In the last half of the twentieth century its population fell by a quarter million from a peak of about half a million. The popular conception is that people abandoned Buffalo because of its weather and faltering industrial base (the '77 Blizzard probably couldn't have come at a worse time). Erie County, however, continued to grow for another twenty years before also becoming stagnant. There are important lessons in this story about the importance of keeping the cultural and economic heart of a metropolis healthy and strong. Even more alarming than the demographic changes in Buffalo is its destructive appetite for land. Even as its population growth stagnated, Erie County has continued to break ground on new greenfield development. Undeveloped land becomes yellow in the decade it develops and then brown. The orange bars in the graph depict population change while the yellow one depicts land developed. Even as population growth tapers off, the pace of development remains unchanged. The Buffalo Niagara Partnership in conjunction with the University of Buffalo has put together a wonderful online resource that explains this dilemma. What I love about this initiative is that they are taking the time to explain the issues not only using data but in an understandable way using transparent methods. This is a topic that deserves its own discussion but this is a great resource for more information. I guess in the 80's this is the transformative power they were hoping the train would bring? Buffalo has the last new “subway” system constructed in the US. Well, technically it’s not a subway because it’s a light rail system but it is underground which most people would call a subway. As a particular quirk, Buffalo’s system is underground outside downtown and at street grade in the downtown. The downtown part is an infamous pedestrian mall (which were popular in the 80’s). Despite these issues it is a well-used system and has no-doubt contributed to the resilient property values north of downtown. The city is now in the process of re-opening the pedestrian mall as most cities have done. There are many more idiosyncrasies and odd urban stories about Buffalo but only so much space. If anyone has any I should know about, especially as they relate to urban design and history, I would love to hear about it.